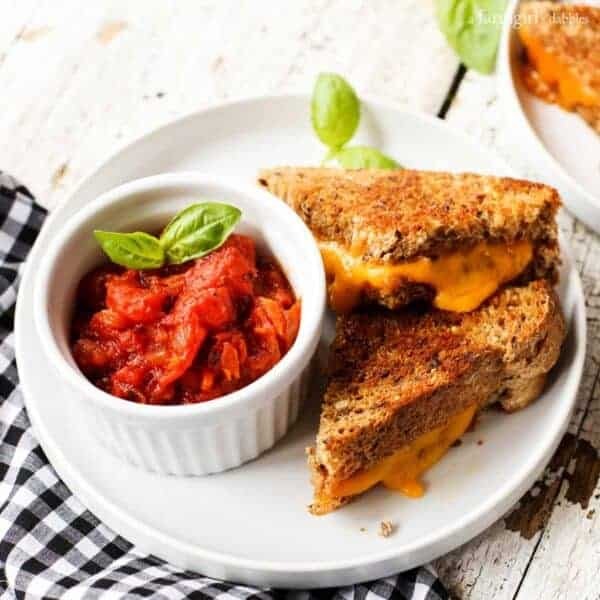 This Spicy Italian Tomato Grilled Cheese Dip recipe comes together quickly, and it’s the perfect way to enjoy a weeknight grilled cheese sandwich! I’m writing this post from our 3-season sunroom, basking in the sunshine and warmer Minnesota temps that are allowing me to be out here, windows open. I just returned from a long, glorious blue-skies walk. The birds are chirping. The purple and yellow crocus and daffodils are blooming in the yard. It is definitely…finally…feeling like spring around here. I can’t help but sound a bit flowery and poetic! No matter the season…spring, summer, fall, or winter…our family never tires of grilled cheese sandwiches. 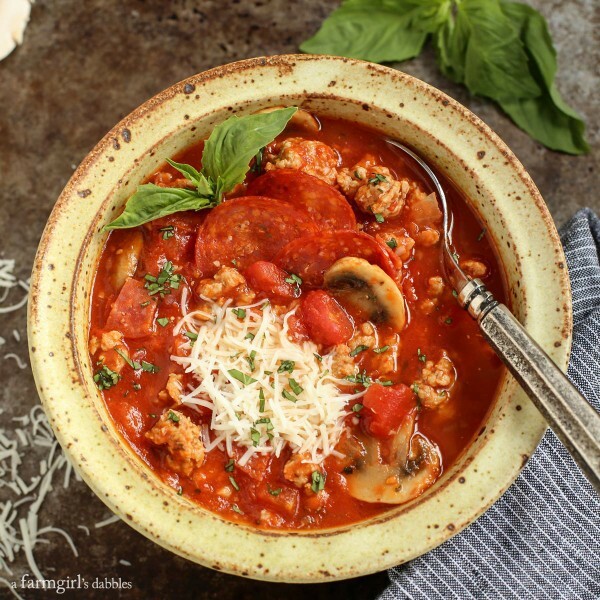 This is a weekly weeknight meal at our house that’s usually served with bowls of steaming tomato soup or some kind of simply roasted veggies. But being able to dip those hot and buttery grilled sandwiches is always the very best treat, I can’t deny it. Sorry, Roasted Veggies. You know how much I love you. And I know how much you’re going to love this Spicy Italian Tomato Grilled Cheese Dip, just as much as everyone here in our house does. It’s rich and tomato-y, and just a little bit spicy. 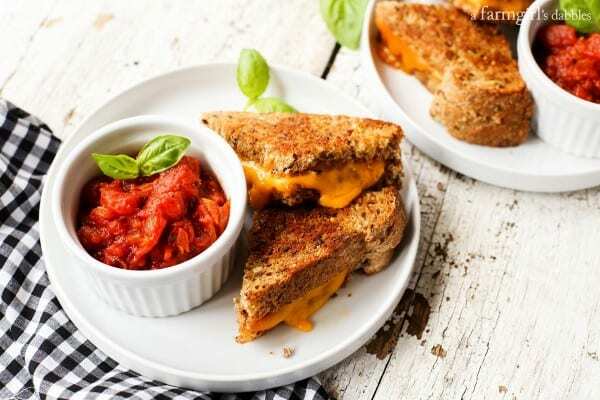 Such a fun way to indulge in a great grilled cheese sandwich! * This post is sponsored by Red Gold. 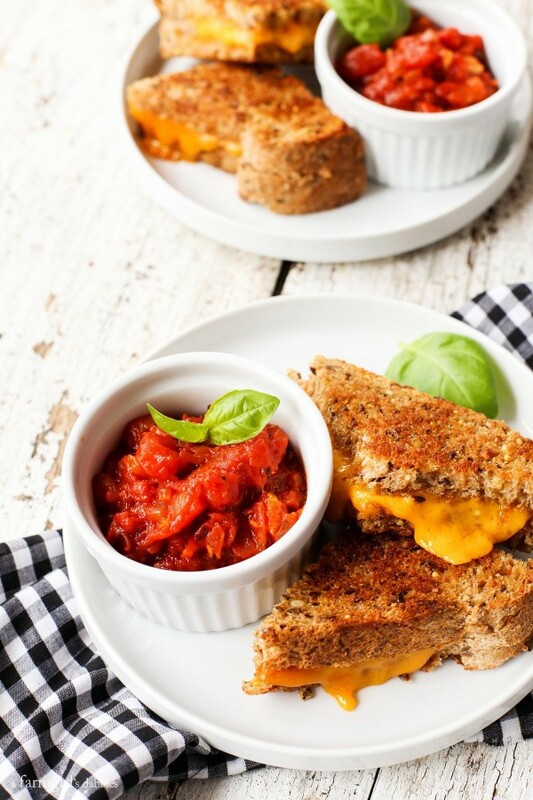 Did you know April is National Grilled Cheese Sandwich Month? 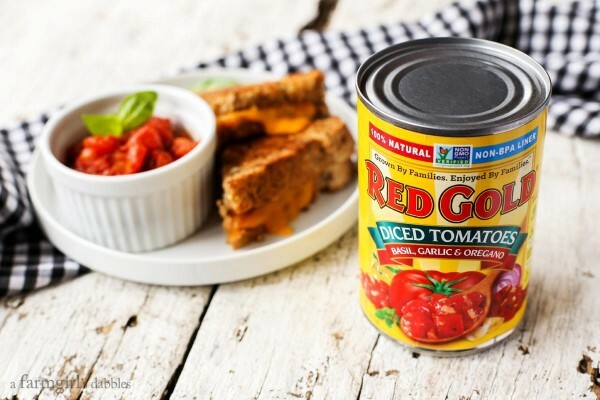 It’s absolutely the perfect time to grab a can of Red Gold® Diced Tomatoes with Basil, Garlic & Oregano, and make this tasty dip for yourself. Our kids have fully embraced this tomato-soup-dipping alternative! 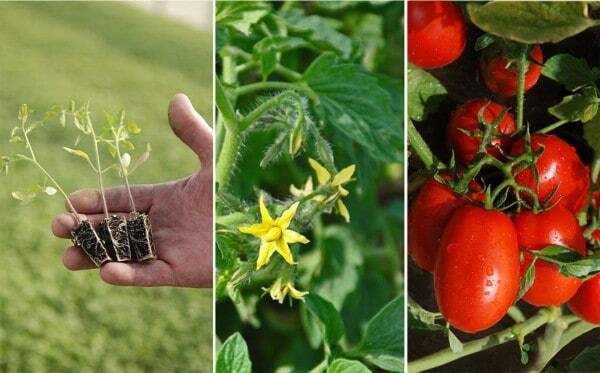 Another season of growing beautiful Red Gold tomatoes is gearing up in Indiana. Red Gold takes great pride in partnering with multi-generational farms that hold like interests in caring for the land for the next generation, and the generation after that. Click here to read about all the ways Red Gold ensures that its operations are sustainable, responsible, and accountable. This recipe starts out by sautéing onion and garlic in olive oil. This is the simple, flavor-enhancing start to so many wonderful dishes. 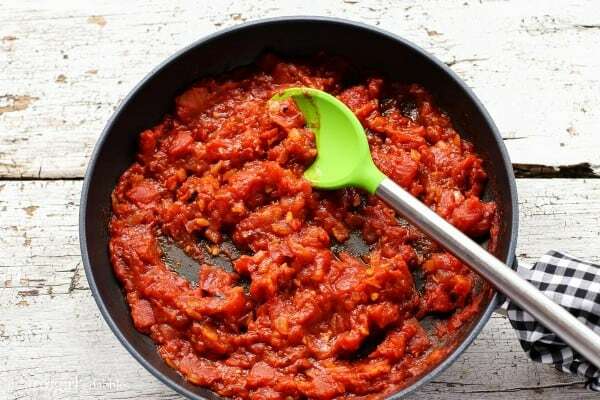 And then there are only a few other ingredients to add to the skillet, to bring this recipe together: a bit of tomato paste, a can of diced Red Gold tomatoes with Italian herbs, a few splashes of tangy white balsamic vinegar, zingy-spicy red pepper flakes, and a sprinkle of salt. That’s it! This spicy Italian tomato grilled cheese dip recipe comes together with very little effort, perfect for those busy weeknights when work and homework and all those other things that fill up the calendar dare to drive you completely crazy. So carve out a little time during the week ahead to stir up this bright tomato-rich dip and to grill some gooey cheese sandwiches. 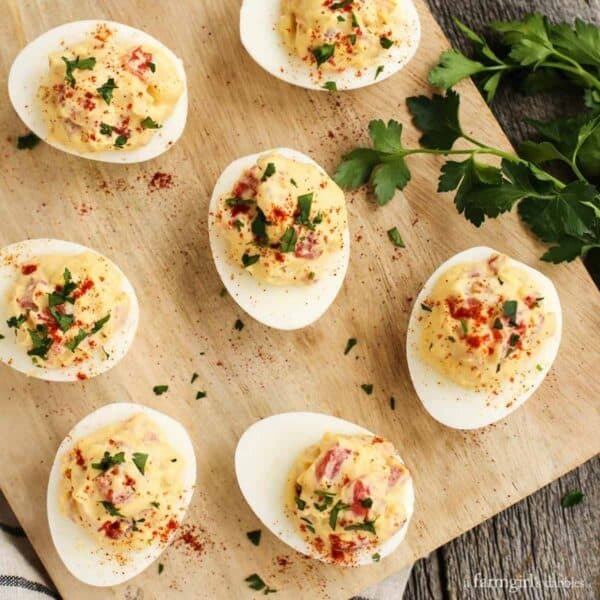 Everyone will thank you for creating this fun and super flavorful meal. I can promise you that. Heat a large skillet over medium heat and then add olive oil. When oil is warmed, add onion and sauté for 3 to 5 minutes, or until nicely softened. Add garlic and cook for 1 minute more. Stir in tomato paste and cook for another minute, until fragrant. Stir in diced tomatoes and red pepper flakes, and bring to a low boil. Reduce heat to medium low, stir in white balsamic vinegar (if you use regular balsamic vinegar, your dip will be a darker color, and not as bright and vibrant), and simmer for 10 minutes. The dip should be very fragrant and slightly thickened. Season to taste with salt. If you like a smoother dip, pulse all or a portion of the mixture in a blender. Serve warm with grilled cheese sandwiches for dipping. This post is sponsored by Red Gold. I am happy to be partnering with them this year, bringing you delicious recipes bursting with fresh, rich tomato flavor. All opinions are 100% my own. Thank you for supporting the brands that help make this site possible.